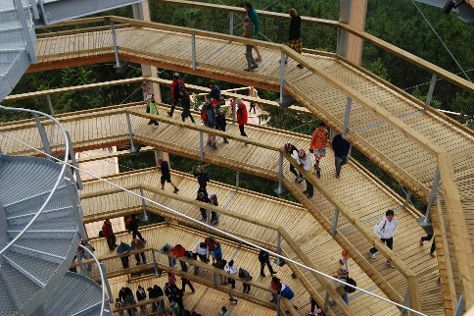 You'll visit kid-friendly attractions like Sportovne Relaxacni Areal Hluboka nad Vltavou and Treetop Walkway. Get in touch with nature at Lipno Dam (Vodni Nadrz Lipno) and Bobova Draha. Explore the numerous day-trip ideas around Lipno nad Vltavou: Kasperk Castle (in Kasperske Hory), The Hussite Museum (in Tabor), Castle Velhartice (in Velhartice), Church of Sts. Peter and Paul (in Nove Hrady), Muzeum Lesnictvi, Myslivosti a Rybarstvi (in Hluboka nad Vltavou), Blatná Water Castle (in Blatna), Pisek Stone Bridge (in Pisek), Telc (State Chateau Telc (Statni zamek Telc), Sv Ducha (Church of the Holy Ghost), & more), Statni Hrad Landstejn (in Slavonice) and Castle Rabi (in Susice). To find ratings, reviews, where to stay, and other tourist information, go to the Lipno nad Vltavou travel itinerary planner. October in Lipno nad Vltavou sees daily highs of 16°C and lows of 6°C at night.